Paul Wilkins and James Ontiveros were college buddies at Cal Poly San Luis Obispo. They were part of a small group of wine geeks who founded a wine group, Vines to Wines. While others were out drinking beer, they were part of an unfashionable small band that visited Kenneth Volk and Richard Sanford, winemaking legends in the Central Coast. Paul likes to tell stories about James coming to school in the morning covered in red dirt after working in his vineyard prior to school. James was the only student in school that was planting a vineyard while attending school. While still in college Paul landed a job with renowned winemaker John Alban in the Edna Valley and eventually was offered an assistant winemaker position. He worked with John Alban for eight years and Paul and James lost track of each other. James eventually became the Sales and Marketing Director for Bien Nacido Vineyard in the Santa Maria Valley. Fast forward to 2005 when Paul left Alban Winery for winemaking consulting positions. Paul was assisting Augie Hug of Hug Cellars and Augie asked him to try and source some fruit from James’ vineyard, Rancho Ontiveros. When Paul visited the vineyard, he was awestruck by the quality of the fruit. After tasting a bottle of Native9 Pinot Noir from the vineyard made by the people at Foxen, he just knew he wanted to work with James. He contacted James and the two decided to develop a partnership in a project combining Native9 Pinot Noir from Rancho Ontiveros and Alta Maria Pinot Noir, and Syrah and Grenache from prime Central Coast vineyards. The two partnered with Sao Anash, former executive director of the Santa Barbara Vintner’s Association and released the first commercial vintage of Native9 in 2004. 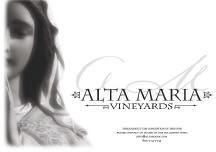 Alta Maria followed with the 2005 vintage and was debuted at this year’s World of Pinot Noir. The goal of both labels is to create awareness and honor the heritage of the Santa Maria Valley. Tucked between Santa Barbara in the south and San Louis Obispo in the north, the Santa Maria Valley has been an overlooked area, largely occupied by farm labor workers. The fact is there is a tremendous amount of viticulture potential still untapped among the many ranches in the area. Because James has a ranching heritage, he knows personally all of the other ranchers in the region. By using James’ contacts, it is hoped that James and Paul can discover and develop many new prime winegrowing plots in the Valley. The name Native9 refers to James Ontiveros’ heritage, nine generations of native Californians. Alta Maria means “Higher or Heavenly Mary,” referring to the name bestowed on the Santa Maria River by James’ ancestor, Don Juan Pacifico Ontiveros in the 1800s. 14.1% alc., 2040 cases, $37. Bien Nacido Vineyard N Block and Q Block. · Dark purple in color. Fruit, fruit and more fruit. A luscious core of sweet dark Pinot fruits from start to finish. Everexpanding voluptuous flavors which seem to never end on the tangy and lengthy finish. Brilliantly crafted and everything you could hope for in a California styled Pinot Noir. I could sip this one all night long. Alta Maria wines are distributed to fine retail wine stores and sold through a mailing list at www.altamaria.com. The 2006 vintage of this wine will be released in December, 2007. It is composed of Bien Nacido Vineyard fruit, destemmed clone 115 from N Block and whole cluster Pommard clone from Q block. Aged in 70% new French oak for 11 months. 805-714- 1732. Contact at info@altamaria.com. Native9 is sold through a mailing list at www.native9wine.com.